We’re getting really close now! Just one month away from the very first book from the whole Huss/McClain partnership and we’ve got blitzes for you to sign-up for! 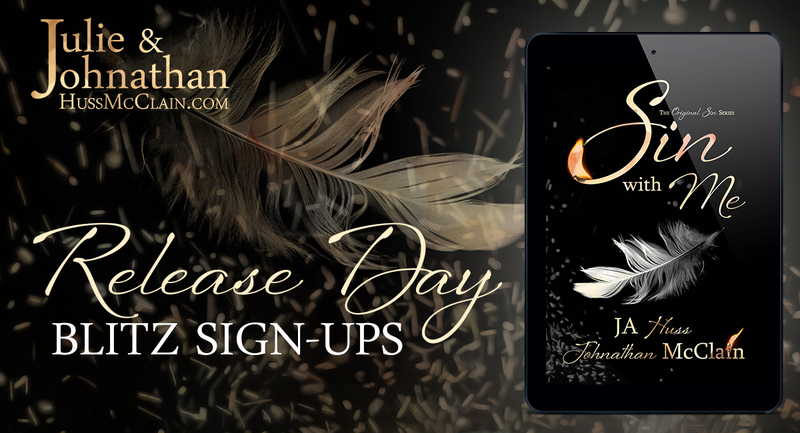 If you’ve never participated in a release blitz for an author first of all YOU DO NOT NEED TO BE A BLOGGER. (At least for the Xpresso Tours blitz!) You just put your social sites in the “blog” field on the form. Then, the week before the book releases you are emailed the media kit which includes lots of teasers graphics, links for the book, and some cool excerpts to post wherever you want. If you run a blog there’s also HUGE GIVEAWAY (and it’s huge, guys!) that you can host on your blog as well. If you don’t have a blog you can still ENTER the giveaway! So if you’d like to give us a hand and help us spread the word about our amazing new collaborative book, just choose which blitz you want to sign up for ABOVE, click the link, and fill out the simple form!